Establishing active transportation goals within their guiding documents and plans. Supporting local strategies that promote their healthy community goals. Collaborating with relevant transportation-related agencies and organizations. Regional, state and federal transportation authorities address connectivity across local jurisdictions and establish area transportation plans. Local agencies’ transportation projects, including safe routes to school improvements, need to be part of the area transportation plan to obtain priority in regional, state and federal funding programs. This guide explains active transportation and the conditions in a community that support safe walking and bicycling to schools and other neighborhood destinations. 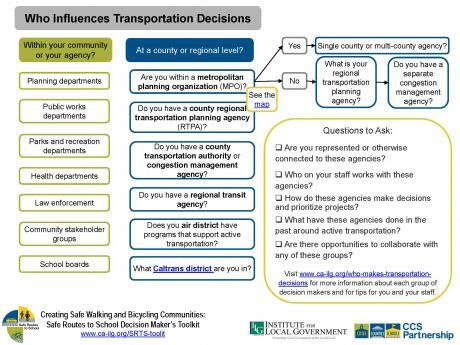 Use this flow chart to help identify potential partners within your community, and as a reference as you read through "Who Makes Transporation Decisions?" at the local, regional and state levels. 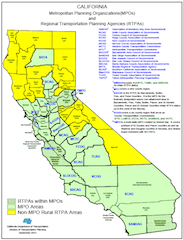 This map of California from Caltrans (2012) will help you determine if your community is within a metropolitan planning organization or regional transportation planning agency. Did you use this toolkit? Please share your story if you found something useful in this toolkit!